This week Mayor Walsh presented his Fiscal Year 2019 budget proposal. On April 24, 2018 the Mayor will present his proposed 2019 - 2023 Capital Plan alongside city officials in Franklin Park at 10:00 a.m. The Capital Plan makes critical investments in the City's infrastructure in every Boston neighborhood, and is guided by Boston's citywide plan, Imagine Boston 2030. Learn more about the budget. 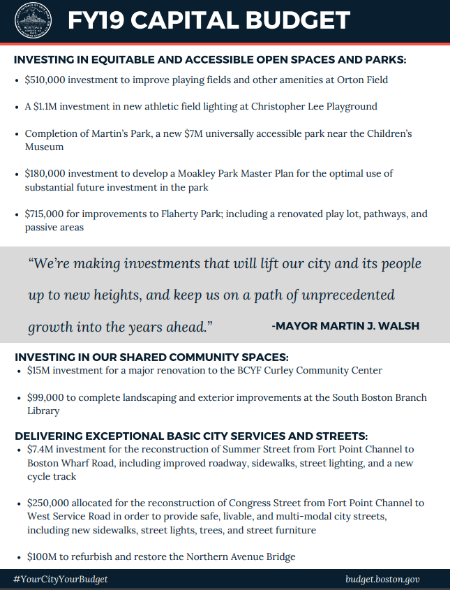 In Fort Point, the proposed capital budget allocates funds toward Martin's Park, Summer Street improvements, Congress Street improvements and the refurbishment and restoration of the Northern Avenue Bridge.